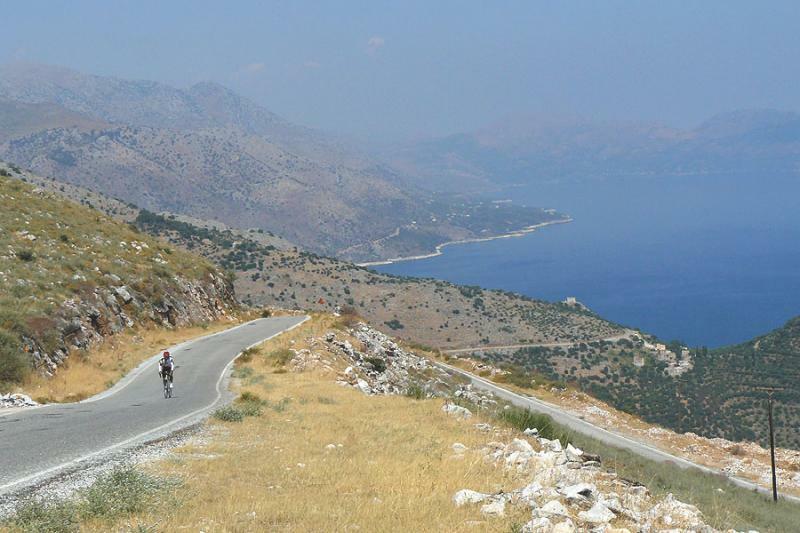 This trip will take you on an unforgettable cycling adventure in the southernmost lands of Greece – Peloponnese peninsula. The varied landscape including beautiful sandy beaches, coves, crystal blue waters, high rocky mountains, green coniferous forests and mediterranean vegetation combined with the ancient historic remains of the regions such as old Venetians castles, ancient theatres, the Towers of Mani and Byzantine fortresses will enchant your minds and spirit forever. You will bike on nice coastal roads winding up and down overlooking the sea, cross the two highest mountains of Peloponnese, explore isolated one line mountain roads with challenging ascends and descends among pristine mountain villages and all of it flavored by the typical Greek cuisine and culture. What is more you will have the chance to feel the lively spirit and buzz of the Greek capital – Athens and visit its most interesting sites. ♦ Methana island - is a unique destination that charms the visitor with its volcanic landscape, healing hot springs and beautiful beaches. ♦ Epidaurus theater - is one of the most important ancient sites in Greece, with an almost perfectly preserved amphitheatre built 2,500 years ago and still hosting Greek dramas today. It is a Unesco world heritage site. ♦ Elona monastery – founded in 15-16 c. the monastery is built in a high rock cliff resembling a hanging balcony. 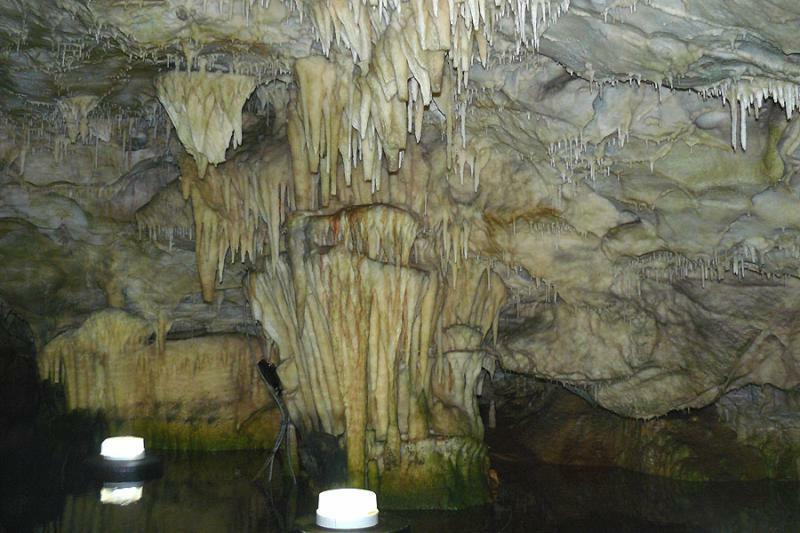 ♦ Pirgos Dirou caves – one of the most amazing cave systems in Greece. It is 5 km long with underground river and lake. It was home of the Neolithic people (4000-3000 B.C.). The visit includes a boat ride and short walk. ♦ The Towers of Mani – about 800 Byzantine towers built in the period13 -18 c. are scattered all over Mani peninsula. They are found everywhere in villages, mountains, on seashores and are an expression of the fighting spirit of the region. ♦ Taygetos mountain – it is the highest mountain in the Peloponnese, reaching 2,407 m - Profitis Elias summit and 100 km long. The mountain got its name after nymph Tayget, the daughter of Atlas. It is a famous hiking destination and was ones one of Sparta's natural defenses. The Taygetos flora numbers about 160 Greek endemic plants out of which 28 exist only on Taygetos. 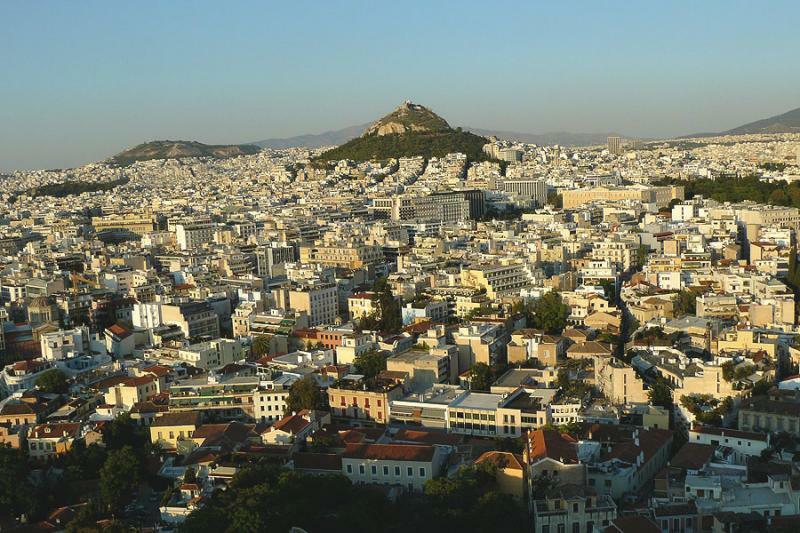 ♦ Athens - the capital of Greece, the birthpalce of civilization. Arrival in Athens airport. Accommodation in hotel in the city center. Free time for sightseeing. Transfer to Kiras Vrisi (80 km). Biking on coastal roads to Methana volcanic island with possible stop at the ancient Epidaurus amphitheater . Overnight in Methana volcanic spa town. In the morning we start with a short transfer back the road you cycled yesterday. 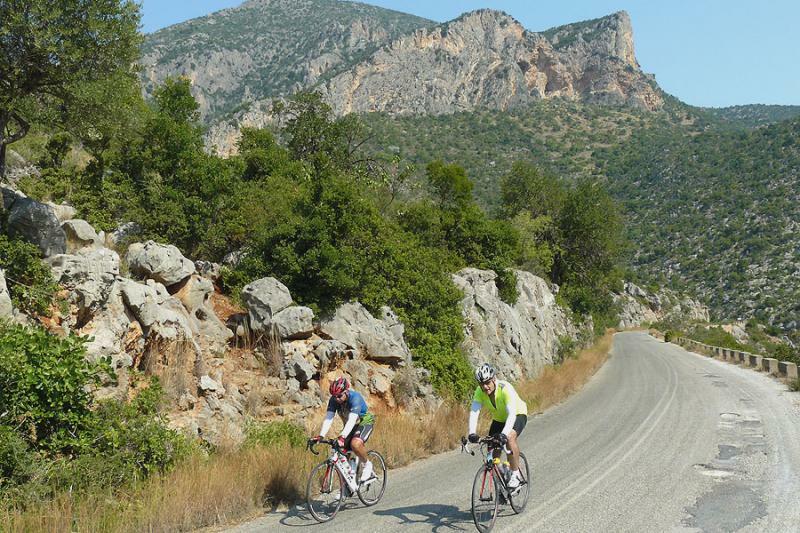 You get on the bikes and following isolated mountain roads reach the beatifull town of Nafplio. Here we can climb up to Palamidi fortress. 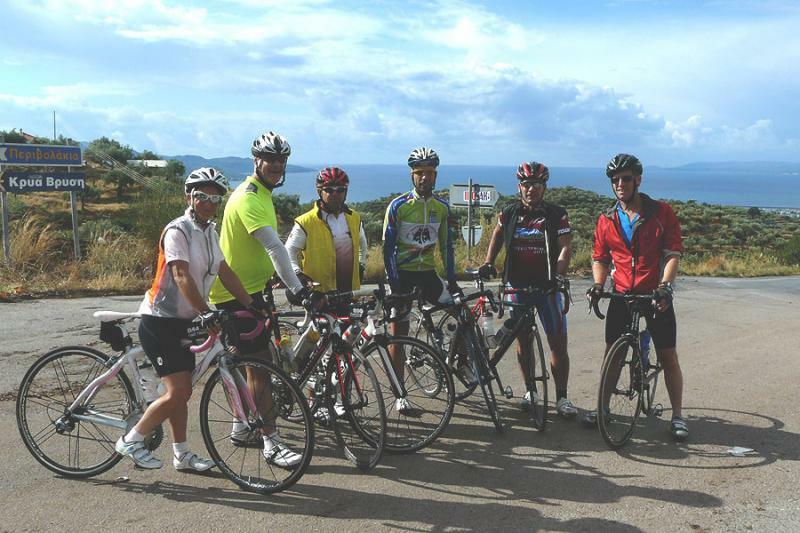 We continue biking on a nice coastal road with views to Agrolikos gulf. 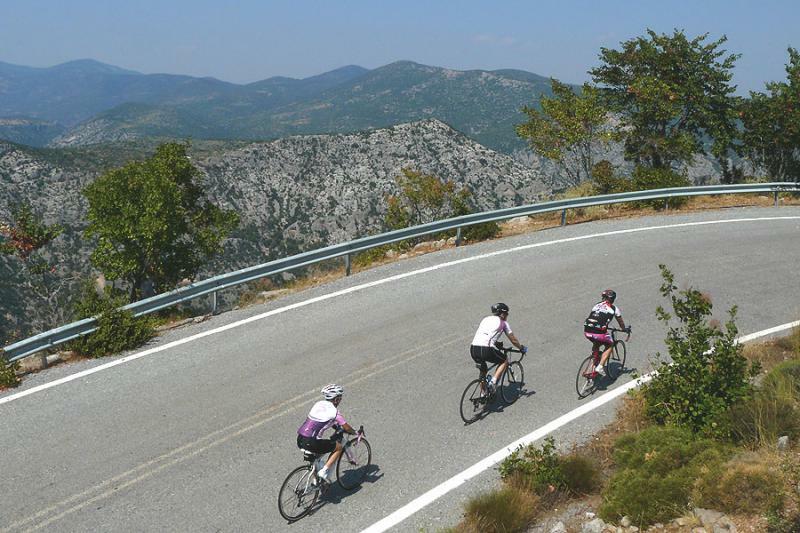 Soon you reach the coastal slopes of Parnonas mountains and finish cycling in Tyros town. Today we have the first challenging ride on a panoramic road crossing Parnonas mountains. Enroute we visit the picturesque Elona monastery built in the rocks. We pass by the peaceful mountain village of Kosmas and soon reach the highest point of the road -1200m. 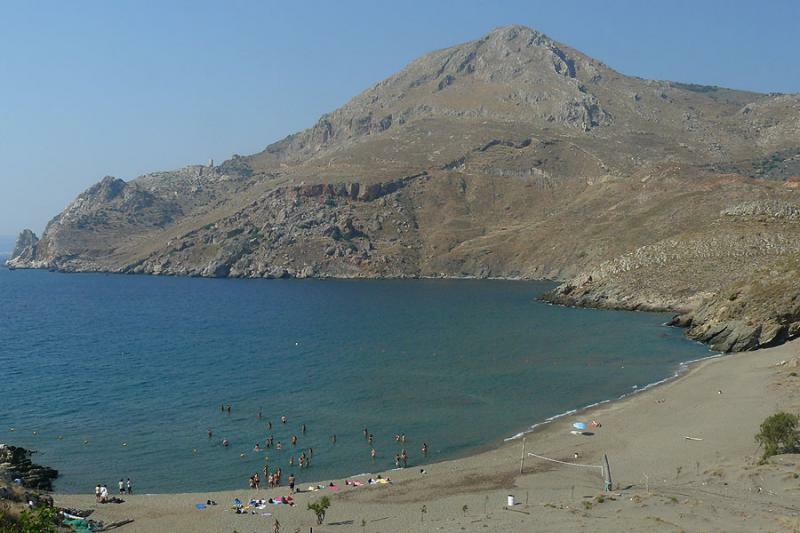 From there we go downhill to the seaside again – Lakonikos gulf and Gythio town. Today we explore the Mani peninsula with its Byzantine fortresses, churches and towers and cycle to the southernmost point of Peloponnes – Marmari. We follow scenic coastal road in the foot of the mountains reach the southernmost village of Peloponnes and bike North on another picturesque road with visit of Pirgos Dirou cave enroute. Overnight in the picturesque Limeni village hotel complex built in Byzantine style. We continue biking on coastal roads going inland from time to time passing through intersting Byzantine style villages and ancient remains on the way. We stop for lunch at the beautiful town of Kardamyli. The cycling ends in Kalamata town, where we spend the night. Today is the most challenging day as we climb the gorge of Taygetos mountain and reach elevation of 1300m. Nice mountain sceneries at all directions. Downhill ride to Sparta town. Transfer to Athens. Accommodation. Free time in Athens. Transfer to the airport for departure. ♦ Bikes: We encourage you to bring your own road bike or rent one from us. ♦ Road conditions: We use coastal asphalt roads in excellent conditions,isolated one line mountain roads in realatively good conditions (some bumpy sections are possible), some with serpentines and lots of sharp curves. Some of the routes include sections with steep ascends/descend . Most of the roads are quiet and calm with low traffic in the tour’s active season. Traffic can be busier when passing trough a bigger village or town. The tour can be done with a road bike or hybrid/trekking bike. ♦ Guide/driver: All bikers receive detailed map and route description. The guide with the supporting vehicle and the luggage inside checks several times a day if everything is OK with the group, accompanying them for breakfast,and helping arranging lunch and dinner and giving them talks by the most interesting sites en-route. ♦ Routes: Routes difficulty and length can be altered according to the cyclist physical conditions and experience. Some parts can be skipped using the supporting vehicle. Necessary equipment: All riders must wear a helmet at all times riding. We encourage riders to bring their own helmets or use one of ours. Cycling gloves, breathable clothes, waterproof gear, cycling shoes/trainers, swimming suit sunscreen lotion; sunglasses with UV protection, (For the full list with recommended items see “General” in the trip dossier).